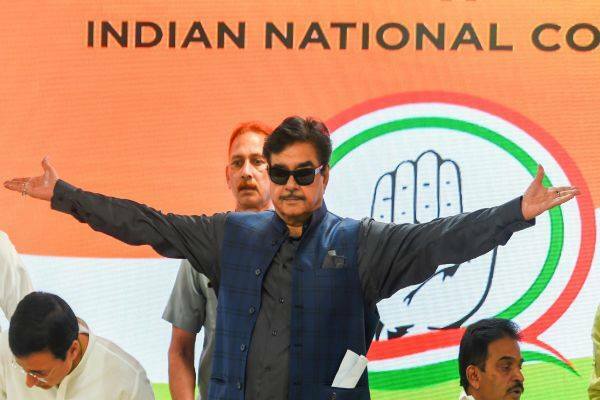 New Delhi, April 6 (IANS) Rebel BJP leader Shatrughan Sinha on Saturday joined the Congress ending his decades-old association with the Bharatiya Janata Party. The actor-turned-politician ended weeks of suspense over his political future and joined the Congress saying that he hoped it will provide him with the opportunity to serve people, society, and the nation. The former BJP MP joined Congress at the party headquarters in the presence of Congress General Secretary K.C. Venugopal and Randeep Singh Surjewala. "I would like to include some of those who've not lived up to the expectations, to those who are responsible for the injustice and for turning Lok Shahi (democracy) into Tana Shahi (dictatorship)," Sinha used a series of tweets just ahead of his joining. "I forgive and forget at this juncture. The differences I have with some of the present people and policies of the party, leave me with no option but to part ways with it," he said. He said he was hopeful that the Grand Old National Party which he was joining "will provide me with opportunities to serve our people, society, and nation in terms of unity, prosperity, progress, development, and glory. This is a party of great nation builders and luminaries like Mahatma Gandhi, (Jawaharlal) Nehru, (Vallabhbhai) Patel, and many others." "Under the present President of Congress the very dynamic, able, tried, tested and successful face of today and tomorrow's India, Rahul Gandhi, I hope, wish and pray that I'm heading into a better direction. Long live democracy and the Congress party, along with the alliance of Lalu and Tejasvi's RJD. Long live our great India. Jai Hind."